Hi Stampers, Today's card is one I made a week or so ago. 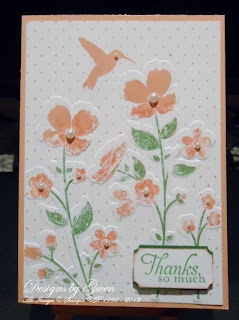 I used the Wildflower Meadow Stamp set and also the Wildflower Meadow coordinating Embossing Folder. There are so many design possibilities with both of these items. I used my Stamp n Write markers to ink up the stamp and the colours I used were Crisp Cantaloupe and Garden Green. The little dots were fiddly to colour so I grabbed a sponge dauber, and added the colour to the dots with that. After the ink was dry I placed the card stock into the embossing folder and lined up the stamped image with the folder and ran/ it through the Big Shot. The sentiment was stamped in Garden Green onto Whisper White Card stock and then Punched out using the Ticket builder punch. I stamped 2 on in the Whisper White and one in the Garden Green. I cut the green one in half and layered it behind the stamped image and attached it using dimensionals. 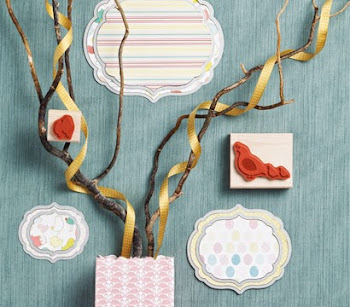 The addition of the pearls from the Basic Pearls softened the card and made it a lovely feminine card. Till next time, happy stamping. This stamp set and matching embossing folder is lovely to work with. I love your colour combination and agree the pearls are the "icing on the cake". Really pretty.